PRESIDENT Emmerson Mnangagwa's government has been taken aback by withering criticism by South Africa's radical leftist leader Julius Malema who described the Zanu-PF leader as a "sell-out". Malema blasted Mnangagwa for his move to start paying compensation this year to thousands of white farmers who lost land under former president Robert Mugabe's land reform nearly two decades ago. Since its formation in 2013, the Economic Freedom Fighters (EFF), which draws much of its support from the rural poor, has called for the nationalisation of mines, banks and other strategic sectors of the South African economy as well as expropriation of land without compensation. 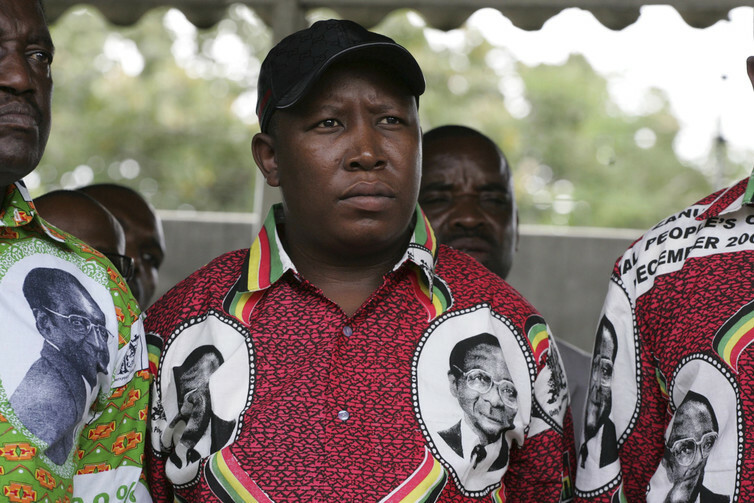 Malema told a news conference in Johannesburg recently: "It's a sell-out position. The way he (Mnangagwa) is going about it, he is not going to finish his term. "That country is swimming in a pool of poverty; they can't afford basic things like primary health, proper education and infrastructure. He gets money and goes to give it to people who are not deserving. He is reversing the gains of the revolution struggle. It's unsustainable." Mnangagwa's government sees the paying of compensation to white farmers as key to mend ties with the West and set aside $56 million in this year's budget to that end. The initial payments will target those in financial distress, while full compensation will be paid later. Nick Mangwana, the permanent secretary in the Information ministry accused the opposition parties in South Africa of crossing the line by interfering in Zimbabwe's domestic affairs. "South African opposition parties have this Big Brother mentality that makes them behave like some super-transnational parties? They have no respect for national boundaries and attendant sovereign autonomy of neighbours. At least our own do their grandstanding on national issues," he said. Hundreds of thousands of Zimbabweans live as refugees in neighbouring South Africa and have been victims of xenophobic violence. Malema recently spoke strongly against the deadly attacks on fellow Africans in the regional economic powerhouse and he received kudos from the Zanu-PF faithful. But he has now seemingly touched a raw nerve as he predicts the fall of Mnangagwa before he completes his term in 2023 over the touchy compensation issue. Over five million Zimbabweans are faced with hunger, according to the World Food Programme after a drought destroyed most of the crop. With little resources, Mnangagwa's government has to rely on the goodwill of neighbouring countries for donations. Mangwana opined that Malema has no moral ground to criticise the Zimbabwean government. He said the Mnangagwa administration was only but following the law. Mangwana said Malema "speaks too fast and thinks slow." "He comments without understanding. He is not a bad guy, but ill-informed comments make one sound like a dunce," Mangwana said on Twitter. "A lot has been said and debated over the last few days, regarding compensation for former farm owners. "For the avoidance of doubt, the Government of Zimbabwe's position is to compensate for farm improvements and not the land. This is a consistent position captured in both our Constitution and enabling laws."